On my first post-Harvey visit to the Brazoria Wildlife Refuge, I couldn’t help smiling at the profusion of water-loving plants I found in and along the ditches: Mexican primrose-willow (Ludwigia octovalvis), salt marsh mallow (Kosteletzkya virginica), Texas spider lily (Hymenocallis liriosme), and broadleaf arrowhead (Sagittaria latifolia). Equally eye-catching, though not at all familiar, was a small collection of milkweeds growing not far from one of the open roads on the refuge. I’d already seen large colonies of slim milkweed (Asclepias linearis) and green antelopehorn (Asclepias viridis) in bud or bloom, so the presence of another milkweed wasn’t so surprising. What did surprise me was the structure of the plant, and the beautiful white flowers. When I consulted one of my favorite online guides to milkweed identification, published by Texas Parks and Wildlife, it showed an image similar to the plants I had found, and described its usual habitat as moist, bottomland hardwood forests of river deltas, marsh edges, sloughs, swamps, and coastal prairie potholes. Of course I sent an email, with a copy to Thomas Adams, a botanist with the U.S. Fish & Wildlife Service who works at the Texas Mid-Coast National Wildlife Refuge Complex, which includes the Brazoria refuge. The larger populations are in and around bottomland forests. I consider this plant #1 for attracting monarchs, but the danger is the plant grows in standing water. Therefore, larvae can be trapped when they need to move on to pupate. While I didn’t see any monarchs — or butterflies of any sort — around the milkweeds, I did find some interesting little creatures hidden among the flowers. Perhaps they were equally pleased to find such unusual plants blooming in an area that has tended to be — prior to Harvey — grassy and dry. To paraphrase an old saying, a flood may taketh away, but sometimes a flood giveth as well. Good for you for reporting your find. You must have made the botanist happy. In the last photograph, based on the insect’s “tail,” it appears to be what’s known as a tumbling flower beetle. I hoped you would link that photo. If you hadn’t, I might have. When I began trying to identify these, I started with a search for “white milkweed,” and that landed me right on your page. When I realized the leaves were different, I went in another direction, but it was fun to see that you have a white milkweed, too. I don’t know if you noticed, but one of the authors of the milkweed identification guide is Jason Singhurst, who’s also one of the authors of Rare Plants of Texas. He’s the other person I sent the email to. Now that you mention it, I remember someone — probably you — posting about the tumbling flower beetle. I was going to send the photo over to BugGuide, but didn’t have time this morning before posting. Now that I’ve looked at more photos on that site, I’m sure that’s it. I think I have some better photos to submit there. I hadn’t (consciously) made the Singhurst connection. I’ve got the milkweed guide and I’ve got the rare plants book. Speaking of rare, I wish I more often ran into Texas milkweed here. In my experience, the species hasn’t been common in the Austin area. There might be a flower that has a greater variety of visitors than the basket-flower, but I haven’t seen it. Every time I find basket-flower, a different butterfly, beetle, bee, or fly has been lurking around. I’m sure there are other creatures I’ve not noticed, as well. I noticed that Texas milkweed’s a good bit west of my area, but I hadn’t realized until I looked again that it’s range is so limited. Now I’m eager to find the pretty pink swamp milkweed. It’s listed for Brazoria, Gillespie, and Kerr counties, so my chances might be good. Such a pretty and delicate flower! I love hearing how, despite the ravages of Harvey, nature is coming back to life. Maybe things will be different than they were before, but I’m enough of an optimist to believe there’s a sound reason for the changes. I’m sure that botanist was thrilled with your email; if not for folks like you, how would they track changes?! Debbie, there are wonderful, great sweeps of flowers in some places. Lantana has made a great comeback, along with sunflowers, goldenrod, and a native morning glory. We’ve had a little more rain, too, which has helped. Strange that we should need rain after all that flooding, but we do. I was so pleased to be able to properly identify the milkweed. I’ve seen a couple of unusual ones this year, and I ought to post their photos. The variety is remarkable, and they’re (mostly) all so pretty. I think the flowers of this one look like little ballerinas. Remarkable as the variety of these flowers is, botanists have recently seen fit to demote the milkweed family to a sub-family of the dogbanes. Sic transit gloria mundi. I saw that. I have a vague sense of the reasons for these changes, including DNA sequencing, but it certainly can be confusing. I smiled at a suggestion I found in this article: that if you confine three botanists and a plant to a room, the plant will end up with four different names. There’s a similar longstanding joke about two Jews having three opinions about something. So: if the botanists were Jewish, what then? That’s the sort of question that could keep me occupied through an entire work day. That might entail the mathematical realm of permutations and combinations, which for your sake I’ll not get into here. It’s interesting to see some of nature’s response to Harvey. I recently heard someone who knows prairies say that floods aren’t nearly as damaging as many people think. Granted, forty or fifty inches of rain in a short time isn’t usual, but the land can cope. I’m sure it copes with flooding rains better than with storm surge — there’s no salt to deal with. They are rethinking the destruction of native prairies west of Houston. These prairies naturally hold and saturate heavy rains, releasing water into rivers much more slowly than concrete and rooftops (which goes without saying). Not sure that housing developments will ever voluntarily be undone though. When I first came to Houston, in 1973, the Katy prairie was a wonder. I used to love going out there to see the geese in the fall and winter. Now? With their habitat gone, so are they. Unfortunately, destroying a prairie is infinitely easier than restoring one. Thank goodness there are people becoming as passionate about saving prairies as the people of League City were about saving their tree. I didn’t count the number of milkweed species that the Parks and Wildlife site listed, but I recall that there are about 50 in Texas. It’s sad that that one and others are declining, but so it is. Your captures are beautiful. Thanks for this information–it’s always good to learn about a new (to me) plant. Until the past four or five years, I knew milkweed only as brown pods and pretty fluff. I’d never seen one bloom until I got interested in native plants. In fact, it took me a while to figure out why my photos of green antelope horn (A. viridis) weren’t as pretty as people’s photos of antelope horn (A. asperula). Once I understood that they’re two different species, I didn’t feel so bad. It is fun finding new plants. It’s even more fun being able to identify them now and then. It does happen more frequently for me now, but my goodness, there’s a lot to learn! Linda, those images are stunning! Wow! Oh yes, the flood giveth! It’s like the phoenix rising from the ashes! May the monarchs find their way to these lovely flowers; Is it normal for them to be blooming at this time? Aren’t they beautiful flowers? Their bloom period is listed from May-September, so they’re right on schedule. My suspicion is that these were encouraged by all the rain, which offered a wetter environment than they usually would find in this particular spot. Or, they may just have popped up. A friend just down the road a few miles called me one day and said, “You might want to get over here. I was mowing, and suddenly realized there are ladies’ tresses orchids all over my yard.” Nature’s unpredictable. Isn’t it wonderful when friends and neighbors awaken to new interests thanks to your own attention to that interest? How great that she called you – and that she spared the flowers! It would be difficult to mow such beauty! I’m sorry to read that the population has declined, and sorry it doesn’t grow around here, it’s really lovely. Your closeup with the little beetle is excellent. I wasn’t here last summer, but heard the monarchs were notable for their absence, so it’s been a relief to see quite a few this summer. This is a plant that makes it all the way up to southern Illinois, but not as far as you. I did find this list of native milkweeds for your area, and was interested that we share at least seven of them. Before Harvey, I was seeing quite a few monarchs here, as well as a lot of queen butterflies. I suspect many of them got blown to “wherever” during the storm, but last weekend I saw two monarchs and a few assorted smaller ones. I’m starting to see more dragonflies and damselflies, too — but I’ve yet to encounter any mosquitoes. I’ve heard reports that they were unbearable in some of the flooded woodlands, and even down at the refuge, but I didn’t see or hear a single one. Maybe they’re done some industrial strength spraying. Well if it exists as far north as s. Illinois, maybe it will make it to NY in a few years, as “The South” continues it’s march to Hudson Bay! I sure hope so, it’s a knockout. Glad to hear the mosquitoes haven’t been after you, although I hope it wasn’t mass spraying. Thank you for the link. I was reading about milkweed, I’d remembered that schoolkids gathered it for life vests during WWII, but didn’t realize the War Hemp Industries had an entire “Milkweed Floss Division.” I just liked that name. I looked at the USDA map, and it doesn’t show Joe Pye Weed in Texas (?) that’s another name I love, and it’s often a fellow traveler with milkweed, and butterflies and bees like it, too. I poked around a bit and found they did some significant spraying. No one is unhappy about it, and I’m sure that part of my mosquito-free roaming has been courtesy the Air National Guard and their planeloads of mosquito-be-gone. Lest you think spraying wasn’t necessary, there’s this, which pretty much matches the descriptions I heard from guys who’d been out in the woods and marshes. I think the language of the guy shooting the video is excusable under the circumstances. Man, that’s almost a Plagues of Egypt situation, makes me itch just looking at those guys. Hard to remain “sanguine” faced with that situation. The Nile’s a perfect example of “good” flooding. One of the little details that fascinates me about it is that the same Ethiopian highlands that contribute to the Nile’s flooding also help to generate winds that may become hurricanes over time and land on our shores. I’m sure that Peggy knows about Monarch Watch. There’s a lot of activity focused on monarchs around here. Schools, parks, churches, and backyard gardeners are incorporating butterfly gardens into their plantings, with a diverse selection of plants (including milkweed) that can attract different pollinators at different times. I’ve heard that propagating milkweed from seed can be difficult, but with all that’s in bloom now, there ought to be plenty of seed available if the mowers will leave it alone. It might be fun to collect some seed and see if I can get some started. Did Peggy start with seed, or plants? Seed, Linda. And so far we haven’t seen any plants. On the other hand, some poppies we planted by seed took three years to come up. I’ve been in a couple of Monarch groves along the Pacific Coast. Absolutely fascinating. Some of those winds do come off the coast, but not all. Here’s a neat animation showing the genesis of Hurricane Isabel. It is lovely, isn’t it? I enjoy a vibrant yellow or purple flower as much as anyone, but there’s something about a white flower that makes my heart happy — and now I have another one to add to my list. ‘Every cloud has a silver lining.’ Harvey caused havoc and devastation but one could be forgiven in thinking that the glorious milkweed was an act of its redemption. It’s a little odd, perhaps, but one of the things I’ve noticed about the newly-blooming flowers is how clean they look: bright, and spotless. With so much damage around, I suppose it makes sense that the contrast would be more striking than usual, but it’s nice to see. These white milkweeds were especially noticeable — just lovely. The flowers are arcanely complex and beautiful. I note that Carl Linnaeus named the genus (Asclepias) after the Greek god Aesclepius, the god of healing. Maybe its appearance is a sign that the injury caused by Harvey is healing . . .? That’s a lovely thought — truly. I have wondered from time to time why Aesclepius was memorialized in the plants’ names, since they can be toxic. But a little exploration revealed that one species, the lovely butterfly weed, was used as an ingredient in Lydia E. Pinkham’s Vegetable Compound. Lydia and her compound are gone, but the milkweed endure — thank goodness. You’re right about the complexity of the flowers. I read just yesterday about their pollination process, which is pretty complex itself. What isn’t complex is the fun of blowing the seeds around at the end of the season, and then spraying the empty pods gold and silver to use as Christmas decorations. Add some paper snowflakes and some glitter-enhanced pine cones, and you’ve got a real celebration going. I have to laugh about Lydia Pinkham. My mom was once interim director of our local Girl Scout council for about 18 months and my dad used to wind her up by saying that the Girl Scouts were founded by Lydia Pinkham. That’s funny. Good ol’ Lydia was good for a laugh or two around our house, too. I saw a Monarch butterfly yesterday. The first one this spring. But I don’t have any milkweed sown in my garden yet. When I do have milkweed I rarely see the flower because the plant is devoured before it has a chance to flower. The flowers you found are delightful, and, yes, like little ballet dancers. I wonder what other surprises the post flood days will produce. I was surprised to learn that you have monarchs, too. I’ve never heard of them appearing anywhere other than the U.S. and Mexico, but of course everyone I’ve heard speak about them has been concerned about increasing their habitat here. This article gives a little information about how and when they reached your neighborhood. Seeing the flowers would be nice, but at least you know your monarchs are feasting royally. Maybe the answer is to plant even more milkweed, so you’ll have some leftovers after they finish their meal. I’ve already been surprised by the profusion of other flowers. I’m really anxious for road repairs at the refuge to be completed, so I can get farther in and see what I can see. Of course, it’s also true that both the lovely yellow rain lily I showed recently, and now these milkweeds, were very close to the visitor center and parking lot. Sometimes, you only have to step out of the car and look. That’s a great article, Linda. From the map, it would seem we are very privileged to have monarchs in New Zealand. I wish we had an endless free supply of milkweed though. Over the years I have tried to plant more and more milkweed but the caterpillars are voracious eaters; it’s impossible to keep up with their numbers and their needs. I think my success rate with monarchs is about one butterfly per plant. Or for every 20 caterpillars on a plant I will get one butterfly. After Vicki (who lives in Australia) commented, I found this article, which is even more interesting. It describes monarchs as “flying weeds,” which certainly reflects your experience with the critters. It’s hard to think of monarchs as invasive species, but in a sense that’s exactly what they are — which could help to explain your experience. The plant/butterfly balance may be a little out of whack because both were introduced. “Monarchs have always been assumed to taste terribly bitter, because of the acrid milkweed on which the caterpillars feed. You always run into monarchs and viceroys when you read about mimicry: viceroys look enough like monarchs that keen-eyed birds who have tasted monarchs once will avoid the viceroys as well. New studies indicate that milkweed-fed monarchs are not so much evil-tasting as literally nauseating, since milkweed contains “heart poisons similar to digitalis” that make the bird ill. Very definitely another interesting article. I hadn’t thought about the role miners may have played in the whole scenario. As for the dried toast taste of monarchs……I am not going to test it out! Great find, Linda! Oh I would love to add this variety to my yardscape. Would be a lovely contrast to the yellow and red/yellow varieties currently squatting the flowerbeds. Going out to Baytown Nature Center this weekend. Will be looking for birds and wildflowers as well while there. I had no idea there was a nature center in Baytown. I wonder why I’ve never heard it mentioned. In any event, now I know. I’ve been across the channel at the San Jacinto monument, but Baytown would be easier access. One of these days I’ll check it out. If your conditions would suit them, I’ll keep an eye open for some seeds. Just planted two seedlings along our natural creek out back, having come from Monarch Madness at a local fall festival, hoping to establish a recurring crop. I’m so glad you were able to pick up some plants. I hope they do well for you. I was hoping for some seeds from these plants, but when I went over to the refuge today, they had mowed them down to the ground. I’m sure they had their reasons, but there were at least three species of milkweed that were just thick over there, and now they’re all gone. Of course, it was refuge staff that did the mowing rather than the county, so I expect there’s some sort of rationale. It still was a little startling. 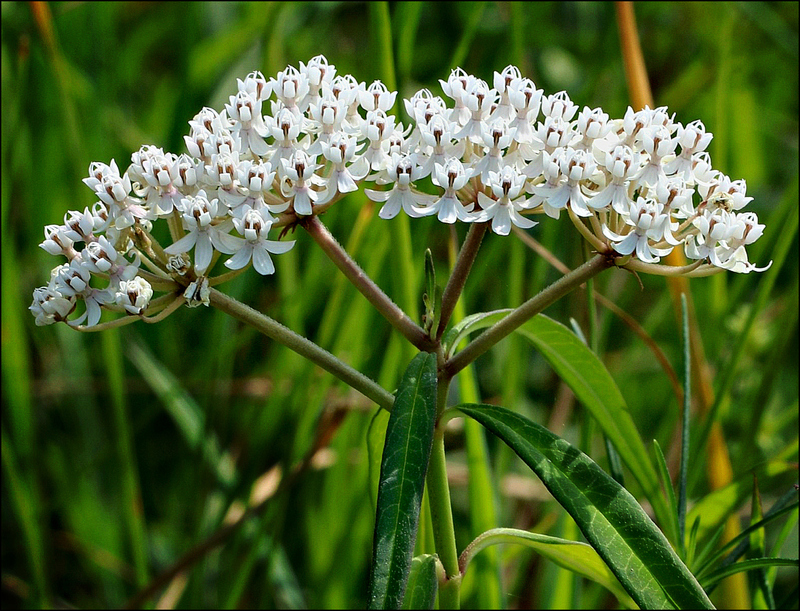 Just to clarify — this one is commonly known as aquatic milkweed, or shore milkweed, even though it’s white. The one that’s commonly known as white milkweed is Asclepias texana, and the USDA map shows it well north and west of us. It’s another example of why the scientific names are so important — a lesson I’m having to learn over and over again! Such a beautiful flower (and superb images too, I might add). Thank you, Vicki. I’ve been puzzled about milkweed and monarchs in Australia, and finally found this article that explains how their presence there might have come to be. It really is fascinating. What a treat to learn of a water loving Asclepias! It is lovely, with those white flowers. And this one, too, makes it to southern Illinois. In fact, its spread into the state is a little more extensive than that of the alligator flag. It goes right up that river corridor and then appears in several of your southern counties. Oh yeah, I see it does. Waayyy down there. If I ever make another trip down that away I’ll have to be on the lookout for it because it is beautiful. What a lovely find- It is quite attractive. I bet you are having a field day at the refugee. You are fortunate to be within driving distance. I still want to get some swamp milkweed which will grow in drier habitat. I was astonished to find so many varieties of milkweed in Texas. I don’t know why it still seems a little strange to me that it grows even in far west Texas. Of course, I was surprised to find it growing in New Zealand and Australia, too (although it isn’t native there). I finally walked the entire circuit of my nearby nature center yesterday, and while it’s a little sad looking without all of the seeds and blooms that always have been there at this time of year, the goldenrod is coming on, and the pretty yellow cowpea is everywhere. I’m going to hit the road early this morning with my fingers crossed that the roads in the refuge are finally open. If not? I’ll see what I can see. There could be something around as interesting as this milkweed. What gorgeous photos! I love milkweeds, but am only familiar with a few of them. That structure is recognizable and familiar. I love the way the white coloring shows it off. 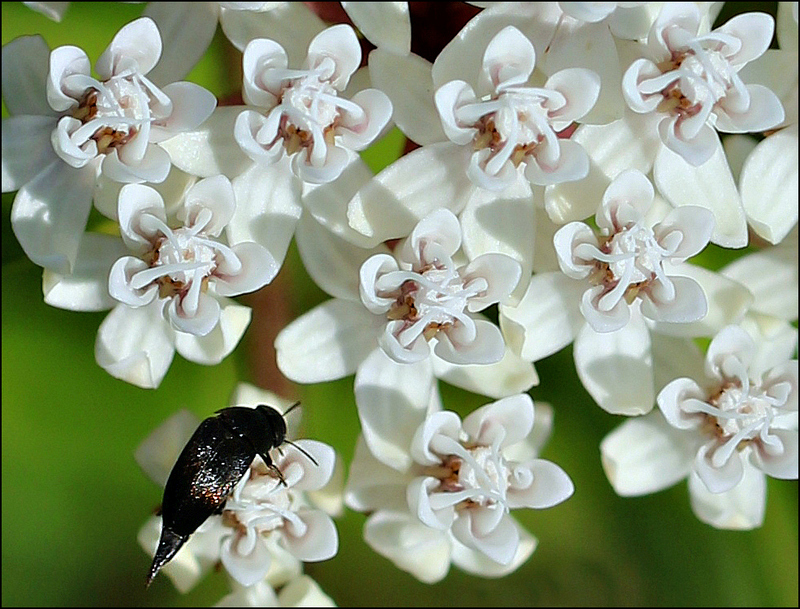 Thanks for showing the details, too – they’re so fascinating in milkweeds. I’ve always liked all the “fives” if you know what I mean. How nice that you heard back when you let them know about your find…and it’s not too late for Monarchs in Texas, is it? So maybe you’ll see one in the area next time. I learned one more thing about milkweeds that I didn’t include in the post. The word used to describe the opening downward of the petals is “reflexed.” When I saw the curled-up petals in this photo, I thought at first they were curling up at the end up the bloom. Not so: they still were in the process of opening. It’s been a real treat to meet so many milkweed species this year: six. I’m on the prowl for swamp milkweed now. There’s still time to find it according to the books, and given the oddities of this year, there’s no telling where or when it might be found. I have seen a few monarchs, and a lot of swallowtails. The little butterflies seem to have disappeared, but I remember them being seasonal, anyway. Now, dragonflies — if you like those, they’re everywhere. Linda, these are so beautiful they almost take my breath away. Your photos are exquisite in the detail. I don’t really know many milkweeds nor do I think I know any that flower (so maybe I know none!) Interesting about the monarch. And a sad dilemma. I’m so glad you’re back in the nature preserve. I know what that means to you. Here’s a secret: every milkweed flowers. But I’m not necessarily surprised you haven’t seen one in flower. Through about sixty-five of my seventy years, I’d never seen one bloom, either. For me, milkweed was that wonderful fall plant with its downy fluff. It never occurred to me that those seeds had to come from somewhere. So, if you see some milkweed pods and fluff in your neighborhood, look for the plants next spring or summer, and voila! You’ll find milkweed flowers. 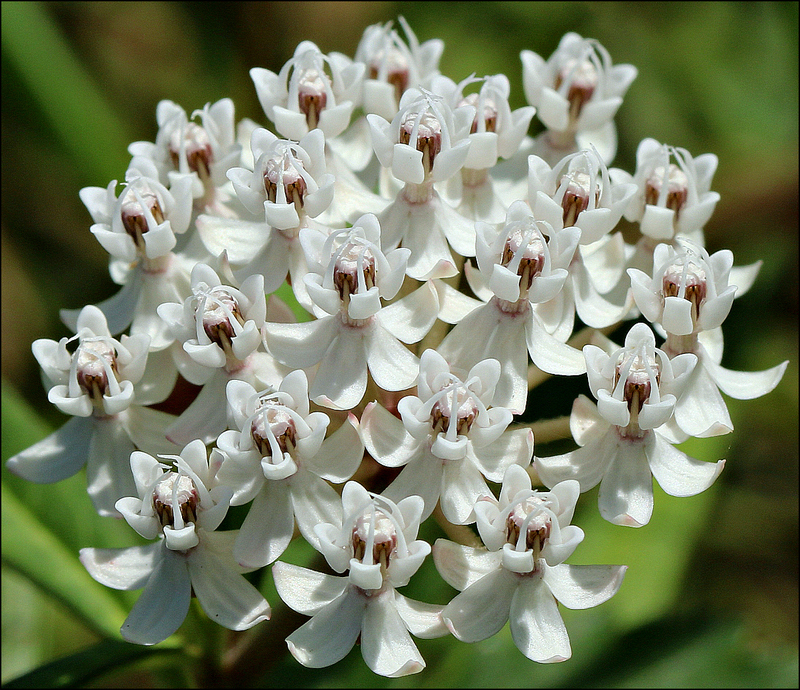 Here’s a link to a page that shows some of your area’s common milkweeds. The only one we don’t share is poke milkweed. The pink one’s the one I hope to find yet this year. We do have beautiful plants, and I suspect we have more of them than most people realize. I certainly was ignorant — not only dismissing some beauties as weeds, but just flat missing others. It’s fun to find-and-share now!